Sometimes, we strike on some movie just to while away the time but ultimately get interested in it because of the players, story, ambiance and narration. I do not know Kannada, but I ventured on a movie titled ‘Katheyondu Shurvagide’ in Prime Video as the synopsis suggested that it seemed to be a new gen movie. Written and directed by Senna Hegde, it is, indeed, a love story supposedly happening in 3 days time; yes, it is again a boy meets a girl but the boy, Tarun, not a teenager, is in a state of bankruptcy as his resort business is nose diving. A honeymoon couple is expected for that forlorn resort but to Tarun’s surprise a young lady only arrives. The answer to his question on her husband shocks him. There is a happily married for 30 long years couple one of whom is expecting a terminal ailment is Tarun’s well wishers and local friends. A stupid car driver in the resort tries desperately to woo the receptionist working with him who is all set to marry a man working in Dubai. What life has for them in store in these three days; something favorable, bad, surprising or nothing? The narration unfolds linearly as a flashback without much confusion. Mother Nature with breathtaking landscapes plays a major part in this movie. There are lot of dialogues on ‘love’ and ‘lost love,’ ‘love forever’ and the vagaries of ‘life’. I am intentionally included a few stills which may induce to watch the movie even if you aren’t a Kannada film aficionado. 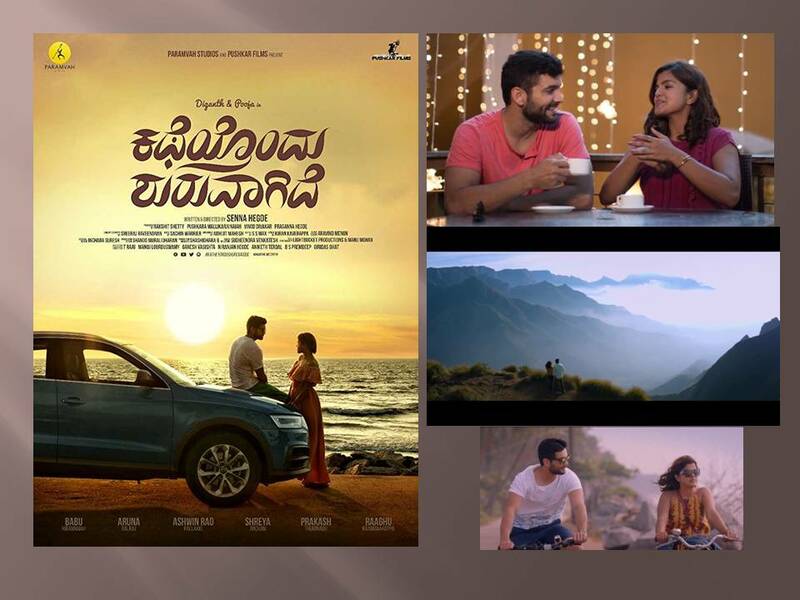 The lead pair Diganth Manchale and Pooja Devariya looks young and pleasing. The supporting artists also fit their roles well. There is a twist in the tale towards the end. Not an outstanding love story; yet, a heartwarming one, even appealing to an oldie like me.